A buzzword is a word or phrase that has become very popular in a certain field or area. There are buzzwords in science, politics, business, and just about every type of work. Some buzzwords replace more common (and often simpler) expressions that communicate the same idea or message. At times, people use buzzwords to “sound like” someone who knows what he or she is talking about. 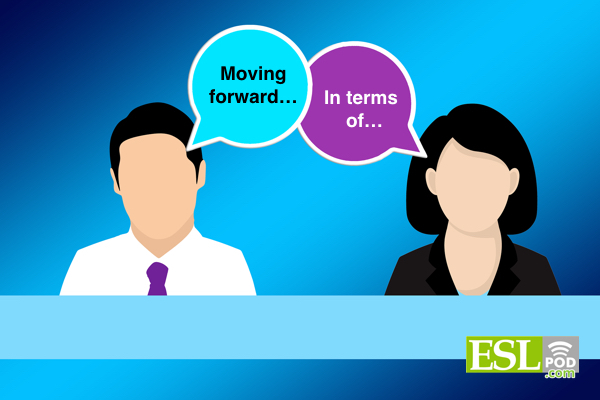 One popular buzzword nowadays (at this time) is moving forward. To move forward in a car means that you drive straight ahead. It is the opposite of “to go in reverse” or backwards. This idea is often associated with change, meaning that we did things this way in the past, but now we’re going to do them differently. For example, let’s say you and your coworkers always start work at 8:00 AM. One day, your boss tells you that he wants you to come in at 7:30 AM. In terms of – This means regarding or concerning a specific topic or issue. It is often used when you are talking about more than one aspect or part of an idea or project, and want to make sure the person listening to you understands which part you’re talking about. This means that loving each other is more important than the problems you and your spouse may have. In terms of moving forward, that sounds like a good idea to me.